Another year of weekly TechVideos starts. Let me write some words today, about a TECHNIC/MINDSTORMS MOC, from Ricardo Oliveira (a fellow PLUG member). 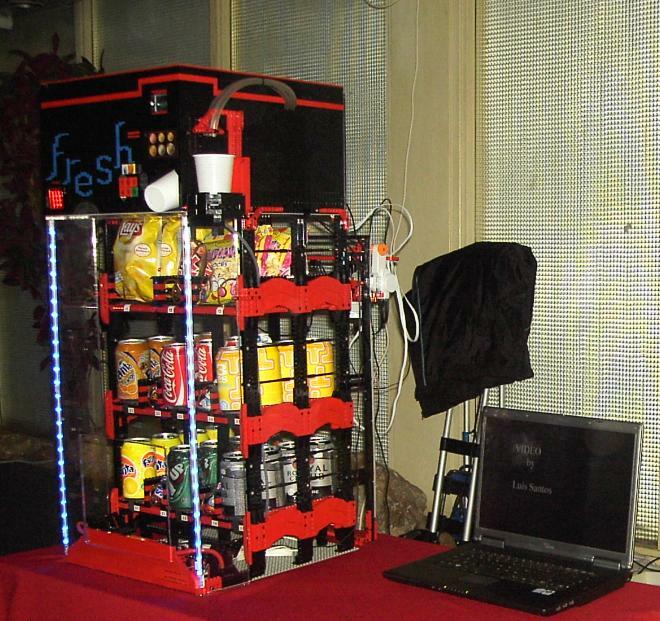 It is a Vending Machine, which already got some versions and modifications. First it was at some Club meetings and BrickJournal (Issue 7, Volume 1 - Spring 2007, pp 67-69). 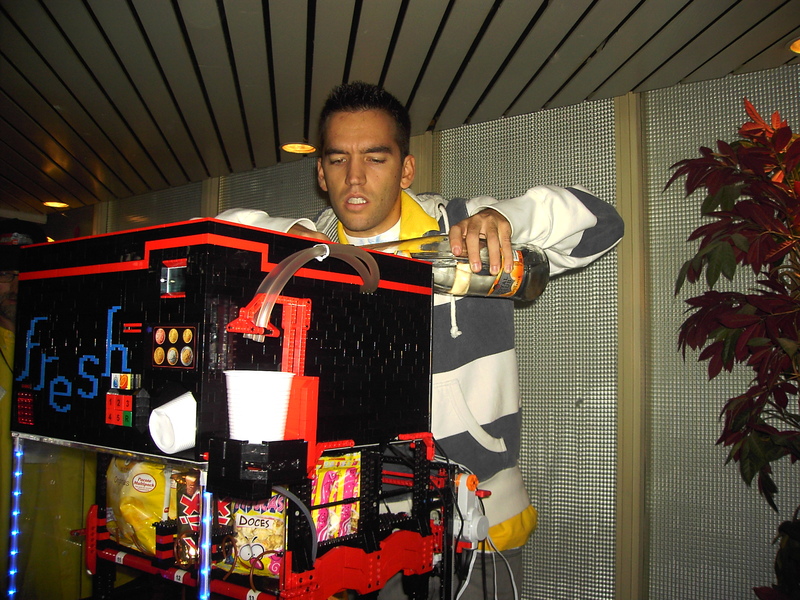 More recently and after the last modifications, Ricardo also took it to LEGOWORLD 2008 in Zwolle, during last October. 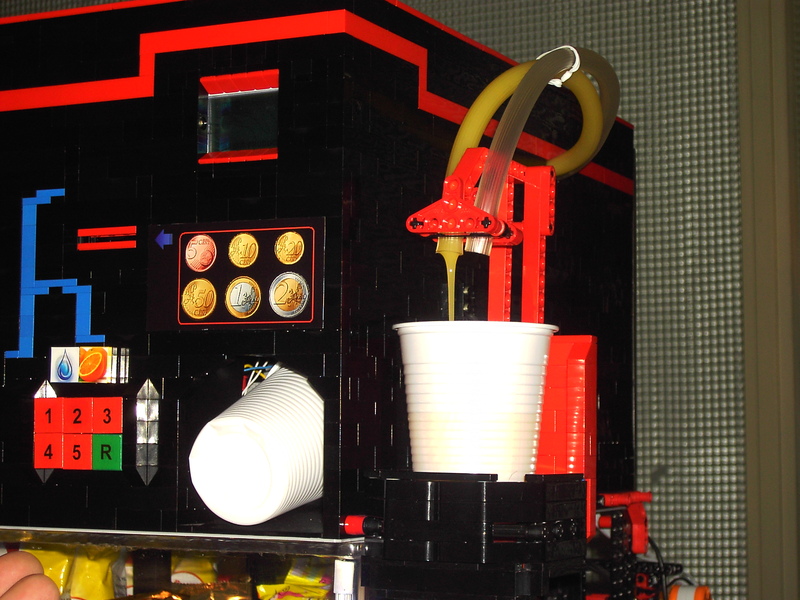 Across time it got several transformations, being the main ones for the last version: Double RCX control, replacement by single NXT control; Use of some Mindsensors stuff and insertion of a two selectable drink dispenser which pumps the drink of your choice, into your cup (see the details on the video below). keeps record of still existing products and coins to give exchange. sorts every inserted coin into its appropriate draw. opens the coins drawer, upon insertion of a predefined passcode. You may find additional photos from Ricardo's work, at his BS folder. Ricardo refilling the VM water tank at LEGOWORLD, on the left picture and some orange juice being serviced on the right. Now you don't have anymore excuses, to not come and read every new TBs post. That is awesome. So many different problems to overcome. The biggest problem I have been having with a Lego beer dispenser is not shaking it up, the padded landing with the suspension has given me some great ideas. I've seen it in person (although I didn't have time to closely study the inner mechanisms) and I can say this is truly the greatest LEGO invention I've ever seen! The sheer functionality, coupled with the imposing, yet familiar looks, all coupled to the "wow, look at it moving" factor, is a clear winner. It is cool for what it is worth, but it isn't exactly 100% Lego. As far as I know, only the "springs" that rotate to push the products and the containers that hold the pressurised beverages are not LEGO, but I don't know how else they could have been built. Strictly speaking, the MindSensors components aren't LEGO either, but in that case I think it can be excused, because they also provide functionality that would be impossible using only LEGO parts. I'm in a middle of some exams, but I promise here that I'll come again and again, regulary, soon. I am really proud to see my MOC here! ;) Thanks Conchas! Now, about non-LEGO parts, it's not just the springs and the recipients, actually :( Also the coin detector system have kind of an aluminium band where coins make the conductivity with witch they are reconized (different resistance values in 1 NXT input, read as a light sensor in percent mode).